Before the karaoke machine there was the piano bar, a laid-back, convivial hangout with an enormous Steinway around which the lonely or the restive or the celebratory could gather, sip, listen to the noodlings of the artist-in-residence, and, when the mood struck, croon along. There were no tinny synthesizers or oblique video accompaniments and very few showboaters to deal with, just a crew of wannabe Sinatras passing the mic, sharing the velvet hour, and rallying under the banner of Porter, Berlin, and the brothers Gershwin. 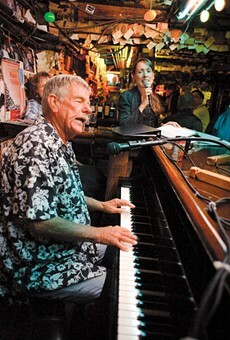 Against all odds, the warmth and immediacy of the piano bar endures in this detached and phobic era, at least in Oakland, where Rod Dibble presides at The Alley's community spinet, just as he has for more than half a century. Pull up a stool, rifle through one of the songbooks, pick a tune in your general vocal range, and wait for your turn at the mic. Dibble has some 4,000 songs in his repertoire, and he's adept not only at guiding the inexperienced past a variety of vocal landmines, he's a marvelous accompanist and an encouraging audience to boot.